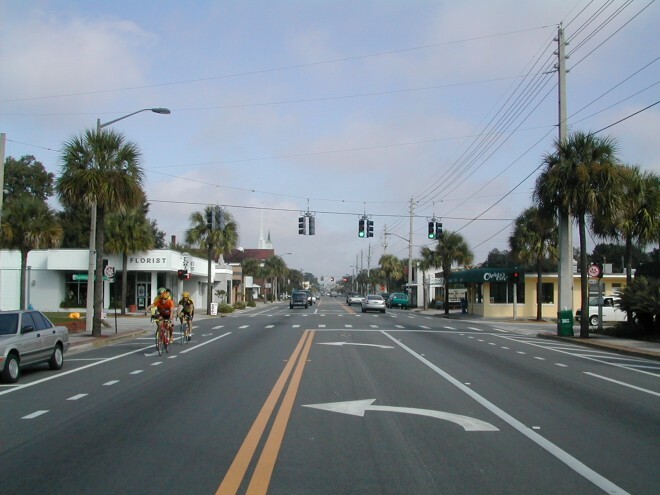 The rightsizing of 1.5 miles of Edgewater Drive in 2002 was driven by the College Park Neighborhood Horizon Plan, which called for making this urban street friendlier to pedestrians and bicyclists. Locals wanted to see the street design support its main street status, instead of just serving as a drive-through street for commuters. The street was transferred from the State to the City’s jurisdiction to enable the lane reconfiguration. The road was converted from two travel lanes in each direction to one travel lane in each direction, plus a two-way left turn lane and bike lanes. As a result, the redesign reduced speeding and accidents, and it increased pedestrian and bicycle volumes, on-street parking use rates, and pedestrian and parking satisfaction. A number of new businesses opened on the street following implementation. Travel lanes reduced from 4 to 3 lanes, including a two-way left turn lane, which minimizes lane weaving and speeding, making the road safer for all users. Bike lanes added to support bicyclists’ use of the street. Speeding is down. The percent of vehicles speeding at 36 MPH or higher dropped from 15.7% to 7.5% at the north end, 9.8% to 8.9% in the middle, and 29.5% to 19.6% at the south end of Edgewater Drive. There was a 34% reduction in crashes per mile travelled (146 vs. 87 annually). Bicycle volumes increased 30%, from 375 to 486. The project had no short-term effect on property values. Neighborhood residential and commercial properties values were compared between 2001 and 2002 relative to county-wide change at the public’s request. They increased in value at the same rate of change as both the neighborhood and the county. Vehicle volumes were reduced, but generally not displaced to nearby streets. Traffic volume declined from 20,500 to 18,100 immediately after the redesign (an average 12% decrease), but increased to 21,000+ in 2007. Volumes have generally remained in the 18,000 to 20,000 range to present. Traffic volumes on perpendicular and side streets in the vicinity declined 4% overall, which is possibly the result of fewer cut-throughs and other neighborhood traffic calming measures. However, there were several streets where traffic increased.AM peak travel times along the 1.2 miles with the highest density of traffic signals increased only an average of 50 seconds, from 3 minutes and 20 seconds to 4 minutes and 10 seconds. PM peak travel time increased by 10 seconds northbound and decreased by 10 seconds southbound. The project had no measured impact on bus loading times or operations. On-street parking utilization increased from 29% to 41%. However, some on-street spots were eliminated as part of the resurfacing unrelated to the rightsizing conversion. 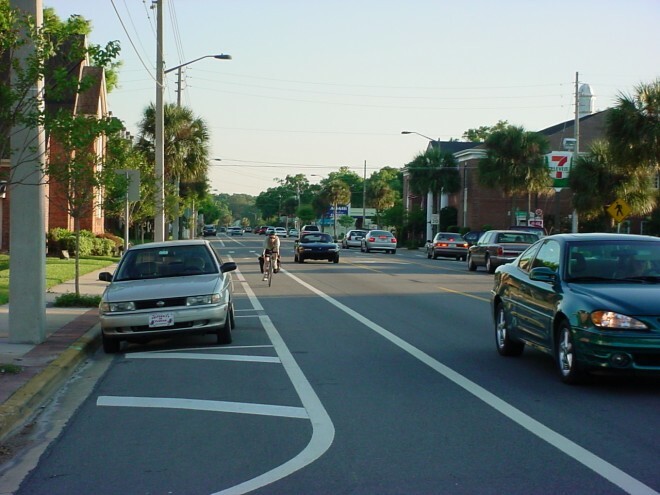 Orlando DOT posits that much of the increase in utilization is due to the increased comfort level of getting in and out of vehicles parked along the roadway. Before and after surveys were conducted with residents and merchants. The surveys demonstrated that people were more comfortable walking and parking on the street after the changes, while merchant perceptions of pedestrian and parker comfort were more negative than self-reported perceptions. Comments also indicated the need to adjust areas of transition between rightsized and not rightsized parts of the corridor. *Before and After Analysis compared three complete years prior to redesign implementation to four complete months after the redesign implementation. Public Process: The public asked for before and after measurements to evaluate whether the trial redesign should be kept. Afterwards, some called for the street’s reversion to its old configuration. However, the street was recently resurfaced again with no call to revert to the four lane configuration, but only public requests to improve aspects of the rightsized design. Additional Costs of Implementation were Minimal: As the project was a simple restriping, the rightsizing redesign cost an estimated $50,000 beyond what repaving would have otherwise cost. These costs were mostly extra staff time for design, outreach, and project management. The different striping requires no extra maintenance. However, as the street was transferred from the State to the City as a condition of the project, future maintenance costs for the City increased, while they decreased for the State. The upside is that Orlando now has more control over planning periodic events on the road.